← Lame Adventure 19: What’s wrong with this picture? Lame Adventure 20: Look Ma, No Hand! There were no beheadings anywhere in this play, but quite a few disembodied hands. As for Christopher Walken, he owns the role of Carmichael, a menacing guy with some loose screws who’s in search of the hand that was taken from him 47 years ago. Walken’s delivery, timing, and body language is spot on from start to finish. He’s great fun to watch. Near the play’s end he haphazardly tosses something out a window that had the three of us choking with laughter. 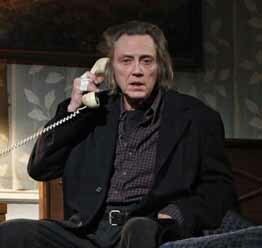 If choking on Christopher Walken’s on stage theatrics is how I’m meant to check out, I would die happy. Another well-timed comic moment is when Zoe Kazan climbs up a radiator pole at warp-speed. At the risk of sounding like a Zoe Kazan stalker, this is the third time I’ve seen her on Broadway, and I’ve enjoyed watching her in each role, first as Marie in a revival of Come Back, Little Sheba, next as Masha in The Seagull, and now as Marilyn in Behanding. Hm, all three of her character’s names begin with the letter m. What does this mean? Probably that I have too much time on my hands if I’m thinking of minutiae like this, and then as further proof of my crackpot-itis, I write about it here. For anyone who’s a Christopher Walken fan like Milton, Albee and me, A Behanding in Spokane is must-see theater. Christopher Walken as left handless Carmichael. This entry was posted in Humor and tagged a behanding in spokane, christopher walken, martin mcdonagh, zoe kazan. Bookmark the permalink. CW- a favorite when will he get an Oscar? He should have at least one by now.. He got one for Best Supporting Actor back in 1979 for The Deer Hunter.